Wilbur D. Peat, an art administrator who spent his life promoting art in Indiana and recognizing Hoosier artists, was a gifted artist in his own right. A new exhibition at the University of Indianapolis Christel DeHaan Fine Arts Center Gallery celebrates Peat’s legacy with “Wilbur D. Peat: An Indianapolis Icon,” a collection of rare works on display through Oct. 5, 2018. An American born in China, Peat trained as an artist at the Cleveland School of Art and became director at the Akron Art Institute before moving to Indianapolis, where he became the architect of some of the city’s most prized arts institutions and societies. “Starting in 1929, Peat was a significant and influential figure on the Indianapolis art scene for the ensuing 36 years. Hired as the director of the Herron Art Museum, he laid the foundation for the current Indianapolis Museum of Art at Newfields,” explained Mark Ruschman, exhibition organizer and adjunct instructor. Katherine Fries, exhibition organizer and assistant professor of art & design, explained that Wilbur Peat’s son David is a letterpress printer and collector, and longtime supporter of the University of Indianapolis arts programs. Fries noticed some remarkable paintings during a visit to David Peat’s home. When he revealed that his father was the artist who had painted them, and explained his father’s role in the Indianapolis arts community, the idea for an exhibition was born. “He was a remarkable man who was involved in a lot of different activities,” Fries said, noting Wilbur Peat’s work as an author, expert and leader of the artistic life and heritage for the city and state. Wilbur Peat was a prolific writer, popular lecturer and talented artist. 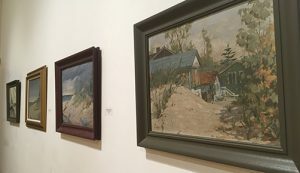 “Peat’s book, ‘Pioneer Painters of Indiana,’ published in 1954 by the Art Association of Indianapolis, chronicles the origins and exploits of the early Indiana artists and is considered a seminal work on the subject. It proved be to an invaluable resource for my 2016 ‘200 Years of Indiana Art’ exhibition, marking Indiana’s bicentennial at the Indiana State Museum,” said Ruschman, who serves as the Indiana State Museum’s fine arts curator. Fries noted that some of the most prized works in the Indianapolis Museum of Art’s collection by Rembrandt and Monet were the result of Peat’s efforts. Peat’s work also had an impact on the development of the Indiana Historical Society, Hoosier Salon and various public artwork projects. “Wilbur D. Peat: An Indianapolis Icon” is a retrospective that covers Peat’s work from adolescence (around 1910) through his very last painting, made possible by the Peat family who are generously loaning the rare works to the University of Indianapolis during the exhibition. “Most of it has not been seen by the public. He did it for pure enjoyment, for the sake of making art,” Fries said. The work of Wilbur D. Peat will be on display at the Christel DeHaan Fine Arts Center Gallery through Oct. 5, 2018, with a gallery reception 4-6 p.m., Sept. 24 and special Gallery Talk at 4:45 p.m. The gallery is open 9 a.m. to 9 p.m. on weekdays. The letterpress collection of David Peat will be featured in an exhibition at the Indianapolis Public Library starting Oct. 1, 2018. More info.